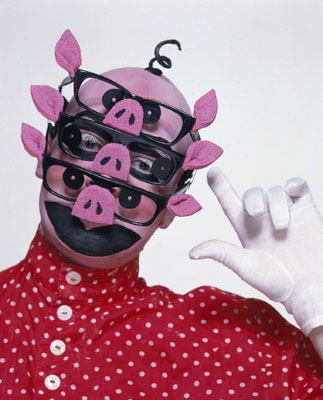 Leigh Bowery, Piggy Leigh, 1986, color photograph. Photo: Johnny Rozsa. Artist is an inadequate term for Leigh Bowery (1961–1994). Australian-born and London-notorious, he epitomized trans-everything: He was a terrifyingly inspired performer, a “fashion-forward” designer/mode, a renegade nightclub impresario, and a noted Lucian Freud model, among other things. That Bowery typically enacted these roles within a “queer” context was not accidental, but it has perhaps been overemphasized. Bowery's riotous exploitation of his own real and ostensible sexual shenanigans leaves homosexuality—maybe any sexuality—rather up in the air, whether as lifestyle, aesthetic strategy, political stance, or anything else. This exhibition, organized by Martin Engler, includes photographs by Fergus Greer, Johnny Rozsa, and others; one (perhaps more) of Freud's paintings; two films starring Bowery; and several original costumes. The catalogue should be a minefield—pardon, a treasure trove—of archival material.